9M0W DX Pedition to Layang Layang Island, Spratly Islands approved for DXCC. 4B4B DX Pedition to Rivillagigedo Islands approved for DXCC Credit. The E44WE operation is good for DXCC credit from 23 March 2017 through 23 March 2018. OZ1AA, Thomas, reports his 4W/OZ1AA log from East Timor has been uploaded to LoTW and "the operation has been approved for DXCC." QSL Manager F4DXW, Stephane, gives "good news" as "all's proofs were sent to the ARRL by email and by mail (paper copy) to accredite the FT5XT activitie and also FT5WQ." The FT5XT operation was from Kerguelen Island on October 11th. Gil has not yet been QRV this year as FT5WQ from Crozet. An LoTW certificate has been requested for both calls and Stephane says once received he'll upload the FT5XT logs. T6/IZ1CCK operation has been approved by DXCC and count for DXCC Award. E31A DX Pedition to Eritrea approved for DXCC, ARRL Awards Branch. VU4YC and 5A5A operations approved for DXCC. Information from ARRL Awards Branch. The 2016 E44CM Operation from Palestine approved by the ARRL Award Branch for DXCC credit. T31T October 2016 DX Pedition approved for DXCC credit. 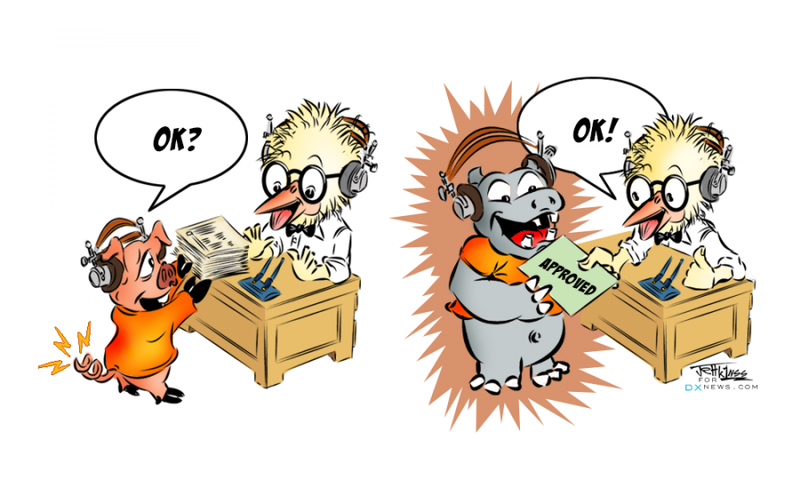 E44QX 2015/2016 operation approved for DXCC. 9Q6BB license approved for DXCC. ARRL DXCC Desk approved credit for the current on going A5A DX Pedition from Bhutan. DXCC Comittee approved 5A1AL Libya all operations. P5/3Z9DX December 2015 operation approved. The recent ET7L dxpedition was perfect and excellent in every respect (IMHO). Therefore it is incomprehensible that ARRL denies DXCC approval though the license was granted by an Ethiopean government organization. 3B7FA in my opinion the dominating modes (cw and phone) should have had priority over SSTV and digimods for DXCC approval during a rare DXpedition as 3B7FA since this expedition was announced and monitored by a majority of international Hams who finally stood aside.